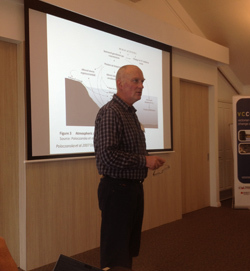 This think tank was convened by Professor Gerry Quinn from Deakin University (pictured) and held in Warrnambool on 16 and 17 September 2013. The think tank brought together researchers, representatives from catchment management authorities, local and state government decision-makers and fishing industry representatives to examine adaptation options for users of two key components of the Victorian marine environment – offshore and estuarine ecosystems. Adopting a 'whole-of-ecosystem' approach, the workshop focused on how key local government, natural resource managers and industries (fishing, tourism, local government planning etc.) can adapt to climate-related changes to these ecosystems. It is anticipated that the report from the worlshop will be posted on the VCCCAR website by the end of November.